The new KanexPro 8x8 HDMI 2.0 to HDBaseT Matrix Switcher is engineered to manage today's A/V formats including 4K, HDR, and object-based surround sound. Designed for mid-scale applications, the KanexPro 8x8 HDMI 2.0 to HDBaseT Matrix Switcher serves as a reliable means to distribute modern A/V content throughout a home. With the growing adoption of formats like 4K and Dolby Atmos, solutions such as the new KanexPro 8x8 HDMI 2.0 to HDBaseT Matrix Switcher (MX-HDBT8x818G) fills the need for devices that can handle the distribution of modern A/V content. KanexPro's latest matrix switcher shifts inputs to outputs over Cat-5e/6 utilizing an HDBaseT switcher to transmit 4K at 60Hz with support for the high dynamic range (HDR) formats HDR10 and Dolby Vision. "Ideal for premium home theater applications, the HDMI 2.0 to HDBaseT Matrix is designed for a variety of applications, including HDR and Dolby Vision providing high-resolution video, a separate audio matrix with uncompressed 4K signals up to 70 meters at a reasonable price," says Kashyap Khetia, senior product marketing manager, KanexPro. "The HDMI 2.0 to HDBaseT Matrix boasts incredible audio and video features with versatile controlling and functionality." The Brea, Calif.-based company's new matrix switcher is HDCP 2.2 compliant, and it supports resolutions up to 4K at 60Hz with 4:4:4 chroma subsampling and multichannel audio. 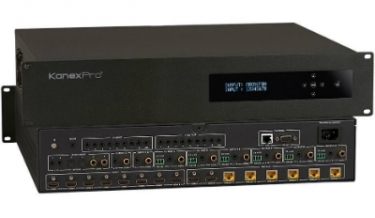 According to KanexPro, the 8x8 HDMI 2.0 to HDBaseT Matrix Switcher complements "mid-scale" installations including residential home theaters, commercial houses of worship, and medical imaging system installations. Some of the control options built into the MX-HDBT8x818G include IR, RS-232, Telnet and a web-based graphical user interface (GUI). Electronics professionals can also integrate the switcher into third-party control systems from top manufacturers such as Control4, Crestron, Savant, and others. 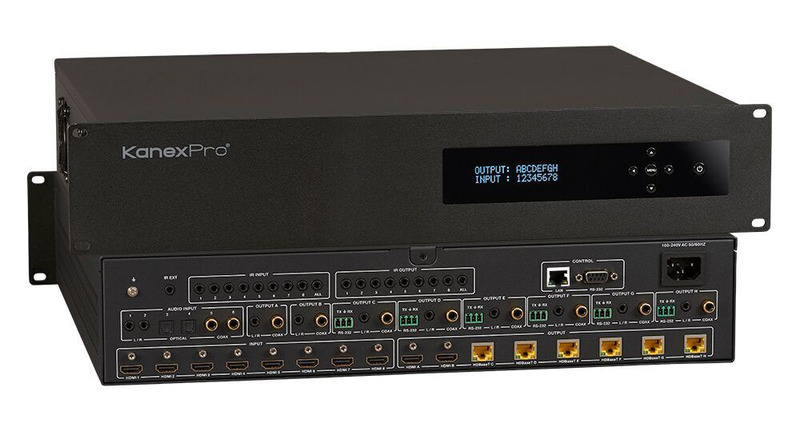 The matrix switcher also supports independent, built-in 18x12 digital audio matrixing with volume and delay adjustments, and its HDBaseT outputs are capable of transmitting signals as far as 230 feet with PoC. In addition, the MX-HDBT8x818G's HDMI outputs are capable of supporting cable lengths up to 33 feet.